Baron Corbin is in the ring. He gloats about Survivor Series, and he gives most of the credit to Stephanie McMahon. Steph heads to the ring. Steph also gloats. She also says that RAW is going to celebrate tonight. Corbin agrees, saying tonight will be great. But first, a little “housekeeping” is in order. Corbin wants to be the permanent GM. Steph says she did make some promises, and with that, Braun Strowman heads to the ring. Strowman points at Corbin and says he wants a match with that “slime ball.” Steph makes the match for TLC. Steph says that if Corbin beats Strowman, he’ll be the permanent GM. But if he loses, he will lose all authority. Strowman reminds Corbin that he can pick the stipulation for their match, and he also reminds Stephanie that he gets a Universal Title shot. Steph says he’ll get his shot at Royal Rumble, but only if he beats Corbin. Corbin tells Strowman that he has a handicap match tonight. Steph changes it to a six man tag match with Corbin on one of the teams. Corbin doesn’t like it. Everyone heads to the ring for the six man tag. Elias is last out, and he decides to play a song. This went on longer than it needed to, but I understand the idea of it. The match was heavily influenced by the story line, and though I liked some of the action, it was ultimately kind of frustrating to watch. After the match, Corbin, Lashley, and McIntyre continue to beat up Strowman. Eventually, Corbin crushes Strowman’s right arm with the ring steps. Strowman is attended to while Lashley, Rush, Corbin, and McIntyre celebrate on the stage. Seth Rollins heads to the ring. Rollins says it’s been six years since The Shield debuted at Survivor Series. Since then, they’ve dominated. Looking back has made this situation with Ambrose even more difficult to stomach. Ambrose still hasn’t faced Rollins, but at TLC Ambrose won’t have a choice. Rollins talks about learning more about Ambrose in his WWE Network special than he ever did from Ambrose himself. Ambrose says he loves aggression? Well, Rollins is looking for a fight right now. Rollins calls for Ambrose to come to the ring, but Ambrose appears on the tron instead. Ambrose says Rollins looks desperate. He’s not going to give Rollins what he wants. Ambrose says The Shield was rotten from the start, and now they are each going to get what they deserve. Ambrose invites Rollins to come find him in the back if he wants to find out what he deserves. Rollins runs up the ramp and to the backstage area. Rollins looks for Ambrose. A member of the crew doesn’t like how Rollins questions him, so Rollins punches him and walks away, still searching for Ambrose. Pretty good match. As it went along Balyey and Tamina seemed to have the most tme in the ring together. It was fine, I’m just really not into Nia Jax at the moment, so that hurt any enjoyment I might get out of this match. And as it is, it was just an okay big person versus not as big person match. Charly Caruso is about to welcomes someone when Dean Ambrose appears on the screen behind her. Ambrose tells Charly to go find Rollins let him know where Ambrose is. Seth Rollins kicks in the door where Ambrose was. Ambrose isn’t there, but he’s painted “burn it down” on the back side of the door. Heath Slater, Rhyno, Chad Gable, Bobby Roode and everyone in catering laughs at Drake Maverick for peeing his pants at Survivor Series. This was wacky. And unfair. It was pretty fun, though I’m looking forward to The Revival getting a win at some point. Clips of Charlotte Flair attempting to injure Ronda Rousey at Survivor Series. Charly Caruso approaches Rollins. 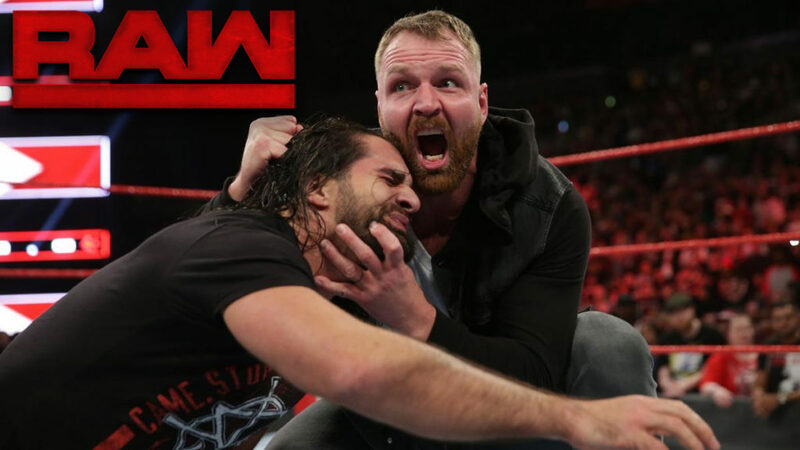 Rollins says he will find and hurt Ambrose. He says Ambrose went too far when he talked about Roman Reigns getting what he deserved. Titus O’Neil walks up and says AMbrose was just here. Rollins goes running in the direction that Ambrose went. Ronda Rousey heads to the ring. Rousey says she understands that she will face Nia Jax at TLC, and she understands how dangerous Jax is. Regardless, Nia Jax will tap out. After that, Ronda is going to find Charlotte and finish what they started last night. Tonight though, she came for a fight. A true champion stands guard at all times. If you can’t defend our position, you stand aside. Rousey will not step aside. She calls for anyone in the back to come and challenge her. Baron Corbin comes out and heads towards the ring. Corbin says Rousey’s request for an open challenge has been denied. Rousey says she has never backed out of a fight, and she doesn’t intend to now. She tells Corbin to go find her a challenger. Or maybe Corbin wants a shot at the champ. Corbin relents. He says he’ll find an opponent for Rousey, but she’ll be the next champ. This match was about Rousey showing that she is a dominant fighting champ and that the beating CHarlotte gave her won’t stop her. This was a very short and unsurprising match, but it accomplished exactly what it was meant to. For that, I liked it. As Rousey is leaving the ring, Nia Jax and Tamina meet her on the stage. Jax shows Rousey her fist, then she walks away. Clips of Lesnar versus Bryan at Survivor Series. A trailer for Fighting With My Family. The match was short, but it was pretty good. Roode and Gable did a good job of moving fast enough to avoid a lot of AoP’s big moves. And the finish was a nice surprise. Dean Ambrose hangs out by himself. Does Rollins think he’s playing games? He isn’t. Ambrose thinks Rollins is very whiny though. This isn’t about Roman, this is about broken brothers. If Rollins finds Ambrose, Ambrose will break his brother. There will be no explanation, and there will be no apology. The B-Team advertises a WWE Shop Black Friday sale. Kayla Braxton asks Seth Rollins if he’s leaving the arena without finding Ambrose. He is, and he does. Good match. I would have preferred it ended differently so it could build to something else, but I liked the match overall. Natalya fought angry, and Riott was calculating. I liked how they worked together. Michael Cole informs everyone that Braun Strowman has suffered a shattered elbow. Dean Ambrose heads towards the ring area. Dean Ambrose heads to the ring. Ambrose speaks mockingly about the crowd and all their “dirty little children.” He says everyone in the crowd would do the same thing he did. They would even stab their friends in the back for a free meal. Ambrose smells something. He smells phony LA garbage. On the tron, Seth Rollins can be seen running towards the ring area. Ambrose sees it, and he tries to decide whether to run or stay and fight. Rollins slides into the ring before Ambrose decides what to do. Rollins attacks Ambrose, and the two brawl in and around the ring. Rollins gets the better of the fight, but Ambrose stops Rollins with a low blow. I think this was a pretty average RAW. Nothing stood out as being great, but I liked the Ambrose/Rollins stuff, the Riott/Natalya stuff, and the AoP/Roode & Gable stuff. The opening segment took way too long to get to the point though. And I don’t care about any of the Nia Jax stuff, and she was on twice, so, yeah. I did like Ronda Rousey’s promo, though I’m not so okay with her basically saying you’re not a real champ if you don’t work hurt. Even being written for her and part of the story, I think it sends the wrong message. Concussions are a big deal, and WWE should treat them as such on-screen. They shouldn’t try to elicit cheers with someone saying someone else is less of a champ because they can’t/won’t wrestle with a concussion. Also, it’s not Becky’s choice to stand down; it’s for her health. Fighting hurt shouldn’t be lauded anymore. They’re going to get hurt regardless, so I’d rather see wrestlers take care of themselves. Also, Nia Jax shouldn’t be rewarded for concussing someone. Whether the punch was intentional (as in both Becky and Nia were in on it) or not doesn’t matter. For one thing, WWE knows better than to do something that dangerous, or they at least know better than to admit to doing something that dangerous. I’m sure Nia didn’t intend to concuss Becky, but that’s kind of beside the point. She did, and it shouldn’t be rewarded. This is my initial reaction. None of the matches were really great, but this one stood out to me for the right reasons.